After entering the packaged beer market with bottles brewed under license off site, Blackman's has brought everything back under its Torquay roof. They've taken delivery of a Cask machine from Canada and entered the world of canned craft beer. 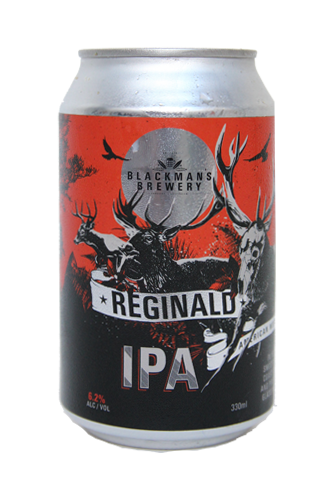 The plan is for all of their core range beers to end up in cans, but first to appear is Reginald, the brewery's American style IPA. The reason it's first in line is because you, the people, demanded it: in an online poll earlier this year, Reginald was the clear favourite, and will be followed off the canning line by Ernie Golden Ale. Look out for small quantities of the brewery's limited releases in tinny form too, including a forthcoming Double IPA. As for canned Reg, he's a hazy rusty coloured chap with an aroma that says, simply: "Hops." Plenty of them too: citrusy, resinous, grapefruity, zesty – creating a palate-smothering drop with its sights set firmly on hop lovers' hearts.